traditional Algerian haïk, taken at the Belaredj collective's November 1, 2014 outing) and a chapter, entitled "Bien Venue on Algerie". (Yes, French-speakers, that is deliberately misspelled, as you will understand if you read the story!) The chapter is a much refined, translated version of the misadventures and misunderstandings I endured in my quest to find my first apartment here in Algiers (which I described previously on this blog in my four-part "House Hungers Algiers" series: I, II, III, IV). 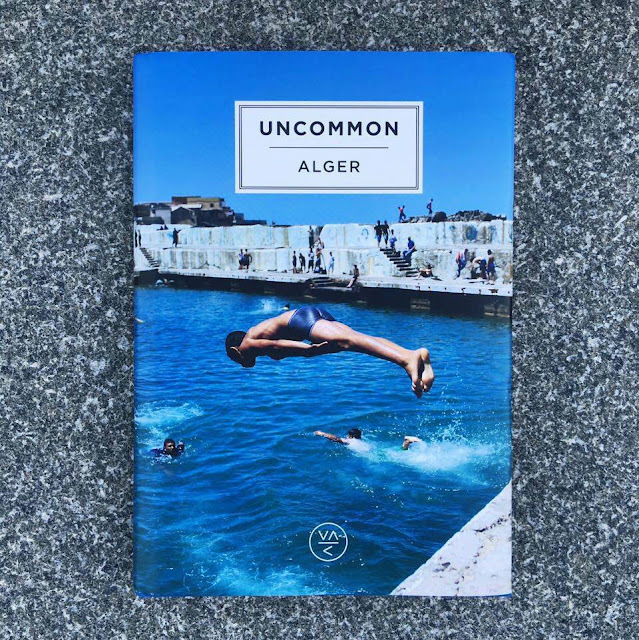 I'm honored and humbled to share these pages with some extremely talented local writers and artists whose gifts are on full display in this volume, combining to communicate the essence of the amazing, tragic, beautiful, and utterly unique city that is Algiers. Many thanks to the Uncommon team, especially to publisher Dora Bouhara for choosing me to help share a bit of her hometown with the world through this project. Support an amazing project by buying your copy today—or better yet, buy a few! can we buy it from USA? By the way your work is outstanding. Bonne lecture and let me know how you like it! I need to explore your site so I have something intelligent to ask you. If you haven't walked down Chemin El-Bakri do so--I lived on the street as a child. It was called Chemin Mackley back then. Our family house was no. 8 but from google earth it looks like the area has seen tremendous development--used to have empty fields we were on the edge of town then. The Japanese Embassy is at no. 1 El-Bakri...it was there back then too. @Alamosa1 How interesting - that is a beautiful area. And yes, like many others, it has probably changed considerably. Algiers has seen a lot of development and construction just in the short few years I've been here. You should come back to visit some time and see for yourself.